Dover, DE – Dominion Brewing is releasing the only 2013 addition to their Pinup Series, Candi Belgian Tripel, this week. Candi is available in the Pinup Pack and on draft. Candi will be replacing GiGi’s Farmhouse Ale as the next rotating brand in the Pinup Pack, a year-round variety 12-pack that includes Dominion core brands Double D IPA and Morning Glory. A third style rotates through the pack three times per year. Based on shared values and a common philosophy of quality brewing, Fordham Brewing & Dominion Brewing joined forces in 2007 and consolidated operations in 2009. The First State is now home to the Fordham & Dominion Brewing Co., where beer lovers from near and far are able to stop by, get to know us, and enjoy our handcrafted beer and soda. Our roots run deep throughout the Mid-Atlantic region and we remain dedicated to our craft. Throughout our history, we have always believed in two things: the beer we make and the people who drink it. Tagged: Old Dominion Brewing Co.
Ft. Collins, Colo. – October 30, 2013 – Attention, Lips Lovers! 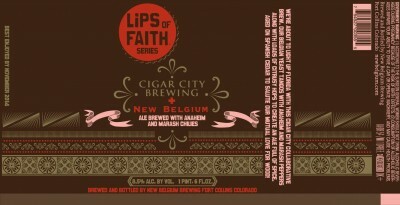 New Belgium Brewing’s two newest quarterly Lips of Faith offerings, Cigar City + New Belgium Collaboration Ale and Wild2 Dubbel are now out for all to enjoy. Collaborations have become a favorite in the Lips of Faith line and this meeting of the minds with Tampa’s Cigar City Brewing continues that tradition. Wild2 Dubbel will reintroduce the soon-to-be-famous Schisandra fruit to beer lovers everywhere. Over in the Hop Kitchen Series, this season’s Fresh Hop is a medium-full bodied IPA made with certified salmon-safe Oregon hops that are picked fresh off the vine and trucked directly to our brew kettle. It starts out malty sweet, builds in some bitterness with a long bitter linger. Learn more about certified salmon-safe hops atwww.salmonsafe.org. Fresh Hop is 7% ABV and 75 IBUs. Tivoli Distributing Company was formed in 2012 to provide a new and alternative route for small craft breweries to access the craft beer marketplace. Tivoli Distributing began this process with the re-launch of Tivoli Beer, last brewed in Denver in 1969, and has followed with the recent launch of Sigi's, another important historic Colorado beer. Tivoli Distributing combines a deep passion for craft beer with a highly personal touch to forge mutually beneficial relationships with both its accounts and breweries. (Douglas, MI) - Complete with new graphics, the highly popular Neapolitan Milk Stout will be available in 4-packs and on tap beginning Friday Nov. 1st throughout Michigan and greater Chicago. This limited release will be available on a seasonal basis only, while supply lasts. To celebrate the launch, SBC will host a release party in the pub this Friday from 5:30-9 pm with a firkin tapping, special one-day pricing on 4-packs and cases to go and a free raffle for SBC merchandise. 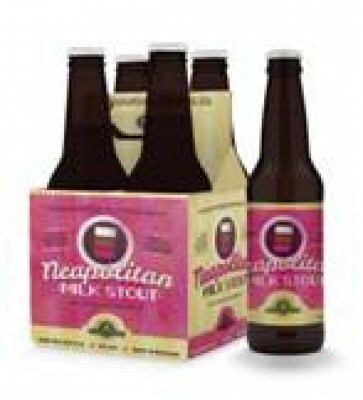 Neapolitan Milk Stout is a 6% ABV dark stout, flavored with vanilla, chocolate and strawberry. LONGMONT, CO & BREVARD, NC- Oskar Blues Brewery will explode into Indiana in November, sending CANs of super-fresh craft-brewed Dale’s Pale Ale, Mama’s Little Yella Pils, Old Chub Scotch Ale, Deviant Dale’s IPA, G’Knight Imperial Red, and Ten FIDY Imperial Stout throughout the Hoosier state. Check your favorite Indy watering holes on Facebook or Twitter for other salivatory beer parties. Distributors for Indiana are World Class Beer-Monarch Beverage for central and south Indiana and Indiana Beverage and Five Star Distributing for the northern region of the state. Oskar Blues beer is currently sold in 30 plus states and will expand into a handful of NEW states in 2014, now that the brewery has expanded capacity in both ColoRADo and North Carolina. The beers also hit Michigan in 2013 and filled voids in areas of several existing states, although the main focus was on getting the new NC brewery up and running. Stay tuned for state announcements in 2014 as Oskar Blues Brewery continues to grow. Oskar Blues Brewery will celebrate the North Carolina’s facility’s one year brewaversary on 12/12/13. Founded by Dale Katechis in 1997 as a brewpub and grill, Oskar Blues Brewery launched its beer canning operations in 2002 in Lyons, ColoRADo. It was the first American craft brewery to brew and hand-can its beer. Today there are more than 250 craft breweries canning beer. The original crew used a hand-canning line on a tabletop machine that sealed one can at a time. Oskar Blues Brewery in Longmont packaged 59,000 barrels in 2011 and grew to 85,750 in 2012 while opening an additional brewery in Brevard, NC, in late 2012.